Dacre Stoker and J. D. Barker however, imagined something quite different, driving a stake through the heart of the 1897 classic further back into its origins and Bram Stoker’s childhood and young adulthood where the mysterious fate of his beloved nanny, Ellen Crone, becomes intertwined with that of his siblings and an evil force even more fantastic than what ended up on Bram Stoker’s pages. The result is a fun, gruesome thrill-ride complete with the tearing apart and re-assembling of a man, among other supernatural horrors. What if the original Dracula was based on actual events ala every recent ghost and demonic possession movie? 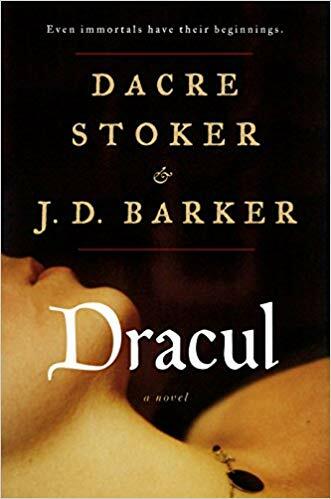 The conceit that Dracul is based on heavy research into Bram Stoker’s life and his original intentions for his iconic classic, while making Bram the main character, adds a nice modern meta spin on the old gothic vampire trope. Of course, the co-author, is also a descendent of the legendary author, adding another layer to the back story. Though at times (with its mirroring of the source material’s structure of journal entries and letters) the book comes across as an elaborate bit of fan fiction, there are some vivid and disturbing descriptions of fantastical horrors that take the sparkle out of vampires and puts them appropriately back into the category of monsters. This makes the sometimes overlong, but often entertaining and fitfully scary, tome a must-read for fans of the original Dracula and old-school horror tales. Maybe one day someone will do a true modern spin that might run the risk of being instantly dated…though so did Bram Stoker’s original…and yet here we are over 120 years later still shuddering at his creation. This entry was posted in Book Reviews, Books, Inspiration and tagged Bram Stoker, Dacre Stoker, Dracul, Dracula, Gothic Horror, J. D. Barker, Novels, Origin Stories, Vampires. Intriguing. Like you, I am a fan of Bram Stoker’s Dracula, though not so much of contemporary vampire literature. Dracul is obviously different. I really like the premise and the spin of this. Thanks for the recommendation and the excellent review. Apart from more gore, it reads very much like a gothic horror novel from a bygone era. If that’s the style you prefer (vs. say Twilight), it should be right up your alley. It is the style I prefer. I haven’t read Twilight and I can’t imagine that I ever would–unless, say, a gun was put to my head… I have read some Anne Rice–Interview with a Vampire and The Vampire Lestat, not exactly my cup of tea but not swill either.